Florida State Road 9B provides a cut-off between I-95 in northern St. Johns County and the Interstate 295 East Beltway at Southside Jacksonville. Opening up additional land for development, including Durbin Pavillion and the Batram Park Preserve subdivision, the commuter freeway also spurs south from I-95 to St. Johns Parkway. Construction of the I-295 Express Lanes from I-95 to SR 202 (J. Turner Butler / JTB Boulevard) modifies the northern exchange connecting SR 9B with the East Beltway. Work adds a new overpass and ramp from SR 9B to the northbound express lanes and rebuilds the SR 9B southbound ramp from I-295 to accommodate a third lane for the express lanes. The I-295 Express Lanes project started in Summer 2016 and runs through mid to late 2019. 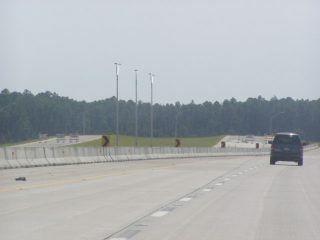 Construction was completed on the first phase of State Road 9B, between U.S. 1 (Philips Highway) and I-295, on September 20, 2013. Work on the initial $75 million segment started in Summer 2010. Work commenced on Phase 2 in April 2013. 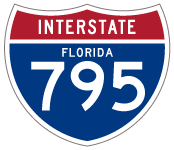 Including the directional cloverleaf interchange with I-95, the $95 million project concluded on June 2016, with the southbound lanes opening to traffic on June 12 and the northbound lanes two days later. Extending SR 9B southward to County Road 2209 (St. Johns Parkway), Phase 3 started on September 8, 2015. The $79.76 million project included construction of a single point urban interchange (SPUI) with Peyton Parkway, a new one mile connector linking SR 9B with Race Track Road. The 2.3 mile segment of SR 9B was fully opened to traffic in August 2018. Florida 9B proposed in 1998. Roadway stubs were incorporated into the design of Interstate 295 (then SR 9A) for the eventual ramps with SR 9B. Photo taken by Daniel Davis (10/20/02). Florida 9B north defaults onto Interstate 295 north at a wye interchange. Photo taken 09/22/14. State Road 9B separates from I-295 southbound via a left exit. Traffic from the I-295 Express Lanes will combine with the forthcoming ramp when they are completed in 2019. Photo taken 06/16/16. Interstate 295 turns west from Florida 9B (Exit 58) across Southside Jacksonville 2.8 miles to meet I-95. Photo taken 06/16/16. Florida 9B concludes a half mile south of the SPUI with Peyton Parkway. Photo taken 10/06/18. Two lanes continue from SR 9B onto CR 2209 (St. Johns Parkway) southbound to CR 210. Photo taken 10/06/18. Separate ramps wind northward from SR 9B to St. Johns Parkway at unincorporated St. Johns. Photo taken 10/06/18. 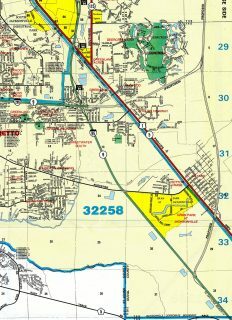 County Road 2209 (St. Johns Parkway) stems 1.25 miles north from a commercialized intersection with County Road 210 to Florida 9B. Photo taken 10/06/18. A pedestrian bridge spans St. Johns Parkway at the separation with Florida 9B to Jacksonville. Photo taken 10/06/18. Heading south from Longleaf Pine Parkway and St. Johns, CR 2209 (St. Johns Parkway) approaches the connecting ramp for SR 9B north. Photo taken 10/06/18. A signalized left turn takes motorists from CR 2209 south onto the ramp for SR 9B north and a succeeding traffic light. Photo taken 10/06/18. 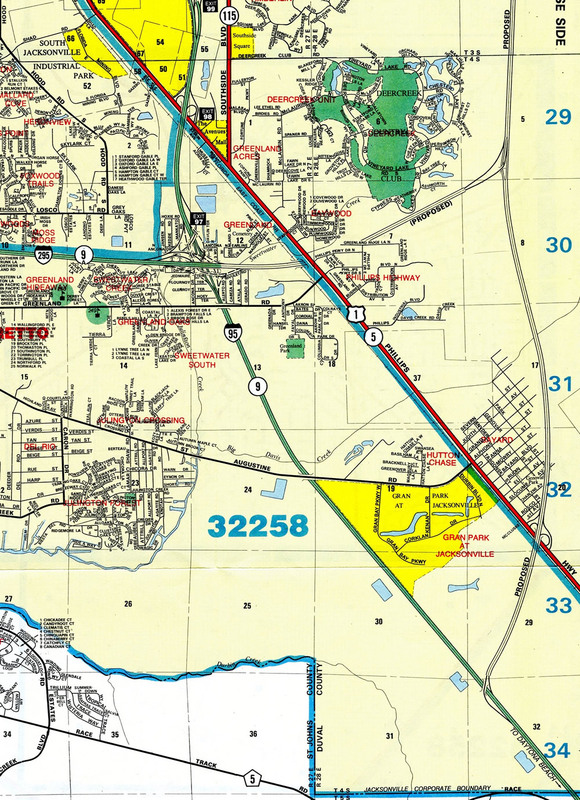 “9A is steadily becoming the I-295 Beltway.” The Florida Times-Union, March 12, 2012. Email response from FDOT on the status of the I-795 designation, dated June 28, 2016. “Florida 9B project is another milestone for Davis family.” Financial News & Daily Record, March 3, 2014.